This is how tradition, like any other substance that isn’t properly maintained or meaningfully refreshed over time, grows toxic. This is also why The Muppet Christmas Carol may be the most important Dickens adaptation of our time. With dialogue that draws directly from Dickens’ words and the inclusion of typically omitted details (like a gradually graying Ghost Of Christmas Present), The Muppet Christmas Carol is unusually faithful to its source material. Grim, Dickensian realities are acknowledged within The Muppet Christmas Carol, yet all 85 minutes are infused with the energy and the imagination of the Muppets, which give a Christmas Carol a hearty enough shake to keep it from spoiling for a few more years. That’s no small feat, considering the film’s timing. Adapting Dickens was one of the last Muppet projects conceived by Jim Henson prior to his death in 1990, and The Muppet Christmas Carol would be the characters’ first big-screen appearance without their creator. That sense of loss is compounded by the absence of Henson’s fellow performer Richard Hunt, who was battling HIV at the time of production and too ill to participate. Hunt died from complications of the disease nearly a year before The Muppet Christmas Carol’s 1992 release; the film is dedicated to his memory and Henson’s, their names being among the film’s first images. And so the spirits watching over The Muppet Christmas Carol are real and imagined, and like the first gathering after a death in the family, the film finds members of the Muppet team slotting themselves into new roles. Making his feature-length directorial debut, Henson’s son Brian steps behind the camera; more visibly (and more precariously), Muppet Show and Fraggle Rock ensemble member Steve Whitmire puts in his first big-screen performance as Kermit The Frog. As this Christmas Carol’s Bob Cratchit, Whitmire’s Kermit fills the role of optimistic reveler, pushing past the miseries of 19th century London and celebrating Christmas in defiance of his miserly employer. This conception of Kermit is critical to overcoming the melancholy circumstances surrounding The Muppet Christmas Carol: A sign that the beloved character is in good hands, hands that know the character, love the character, and want to keep the character alive for new generations of Muppet fans. 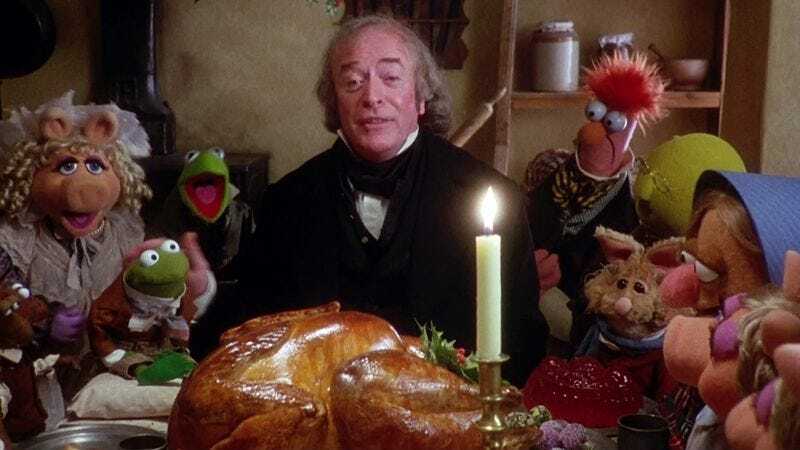 The story being retold in The Muppet Christmas Carol softens the impact of Henson and Hunt’s absence as well, because it’s not really about the Muppets. In a trend that continued with 1996’s Muppet Treasure Island, the focal point of the film is a human: Michael Caine as Ebenezer Scrooge. Much of Caine’s screen time in the film plays like a Victorian variation on The Muppet Show, as the sole flesh-and-blood performer acting alongside and reacting to a supporting cast made of textiles and foam. Introduced in an eponymous musical number (one of the catchiest songs Paul Williams wrote for the film), Caine’s Scrooge towers over the Muppet characters, a canny illustration of Scrooge’s imperiousness. Frequently the only human in front of the camera, Caine’s performance and the film’s script underline Scrooge’s self-imposed exile, a state further emphasized by the frequent closeups of Caine’s face. Meeting the supernatural challenges of a live-action Christmas Carol take head-on, the fantastical world occupied by Caine’s Scrooge is in place well before the first spirit arrives. Populated by talking fruit and singing mice, this soundstage-London establishes itself as a place where anything can happen. The cold-hearted miser might as well get whisked away on a journey through his past, present, and future—he already has a team of rats keeping his books. Within those heightened circumstances, the ghosts break from established reality by reversing the film’s sense of scale, Christmas Present and Christmas Yet To Come dwarfing Caine in the same way Caine looms over his Muppet co-stars. But Victorian struggle can’t keep a Muppet down, nor can courtly propriety: Electric Mayhem drummer Animal can only ding a triangle for so many measures before he leads his bandmates into a frantic Yuletide rag at Fezziwig’s Christmas party. (Or “Fozziwig’s Christmas party,” as the case may be.) Sewn into the structure of someone else’s story, the Muppets’ anarchic sense of humor occasionally lashes out to take ownership of this Christmas Carol, punctuated as it is by puppets flying, falling, crashing, and smashing through the frame. Many of these slapstick gags are reserved for narrators Gonzo The Great (in the guise of Charles Dickens) and Rizzo The Rat. Though they’re relating the author’s own words, the duo bears the violent brunt of every filmgoer who’s ever been irked by intrusive cinematic voiceover. It’s a self-aware joke that marks the movie as a Muppet movie, even without contributions from the man who taught the Muppets how to be self-aware. Like many a Scrooge before and after him, Caine’s turn as literature’s most famed skinflint ends with a promise that he will “honor Christmas, and try to keep it all the year.” Dickens (the real one as well as his banana-nosed Muppet Christmas Carol counterpart) tells us that Scrooge was better than his word, becoming a steward of holiday spirit and tradition, the likes of which London had never seen. This is the upside of tradition: With commitment and personal flourishes, it can be maintained and passed on, just as Dickens did for English Christmas customs, and just as the Muppet team did in the immediate wake of Henson’s death and Hunt’s illness. Tradition is no good if you keep it to yourself: If we can learn anything from any version of Scrooge, it’s that the things worth celebrating are also worth sharing, so long as we leave our own mark on them.